We have not been publishing all the mistakes this company has made lately because we feel our readers got the message on this so called autograph authenticating group. However, when a group like this hit’s a new low the story needs to be told. 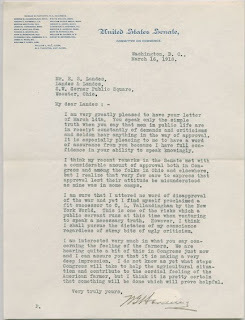 Currently listed on eBay item # 110412169299 for $499 is a letter said to be signed by Warren G. Harding. ANYONE who collects items signed by the presidents of the United States would know that the signature on the bottom of this letter is secretarial. And a well documented secretary at that. Reference books on presidential autographs and educational articles have been written about this "very common" secretarial signature. It certainly appears as if the authenticators at this company either just don’t care, do no research or are just dysfunctional. It certainly appears this autograph authenticating business has become more of a scam than anything else. JSA (James Spence) who likes to use the phrase "Follow the Leader" is not only responsible for this blunder but takes it one notch lower with extreme incompetence. Look at the illustration of the signature closely. 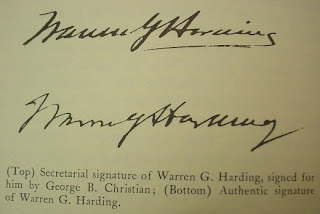 Notice the oval coloration starting at the capital "H" and ending near the "g" in Harding’s last name? One of the half wits working for Spence placed the JSA Certified sticker on the back of the Harding letter basically right over Harding’s signature. By the way, the presidential/political authenticator for James Spence authentication is none other than John Reznikoff of University Archives. Anyone surprised? If not James Spence, who do you recommend?